Click here to find activities and a craft for A HIPPY-HOPPY TOAD! Anne Wilsdorf's illustrations for Sophie's Squash were described as "bursting with color and energy on every page" in a starred review from Booklist. She has illustrated numerous books for children, including Sophie's Squash Go to School, the sequel to Pat Zietlow Miller's Sophie's Squash, as well as Susan McElroy Montanari's My Dog's a Chicken, Elizabeth Bluemle's Dogs on the Bed, Eileen Spinelli's The Best Story, Sharon Arms Doucet's Alligator Sue, and Lenore Look's Ruby Lu series. The inspiration for A HIPPY-HOPPY TOAD came from a walk in the park. My husband and I were walking on the path at Quail Ridge park in St. Charles County, Missouri. We saw a very tiny toad sitting in the middle of a big wet spot on the path, formerly a puddle from the rain the night before. Immediately the words started popping into my head! When I got home I wrote down a rough first verse of 'Toad in the Road.' After that the story stayed in my head even as I worked on other stories that I had already started. The second half of the story came in the spring of the following year on another walk at the same park. Our grandson was with us, and he wanted to walk on the dirt trail, off the paved walking path. It only took a few seconds to realize that there were literally hundreds of teeny tiny toads on the path! That was just the push that I needed to put TOAD at the top of my writing list! And many revisions later A HIPPY-HOPPY TOAD is finally coming to life. "...a rollicking read-aloud featuring a very tiny toad who gets displaced as animals–and humans–brush past him on the road." It’s hard to be a tiny toad minding your own business on a twig. First a bird pecks at him. . . . Then a bee buzzes. . . . Then a dog barks . . . and so on. And each time the toad is surprised by a buzz or a woof (or the toe of a sneaker! ), he hops to a new location farther down the road. With fun sounds, clever rhymes, and an irresistible rhythm, this is the perfect story for sharing one-on-one or in a group. A HIPPY-HOPPY TOAD is a finalist for the 2019 Indiana Early Literacy Firefly Award! Please help your child vote for their favorite picture book! 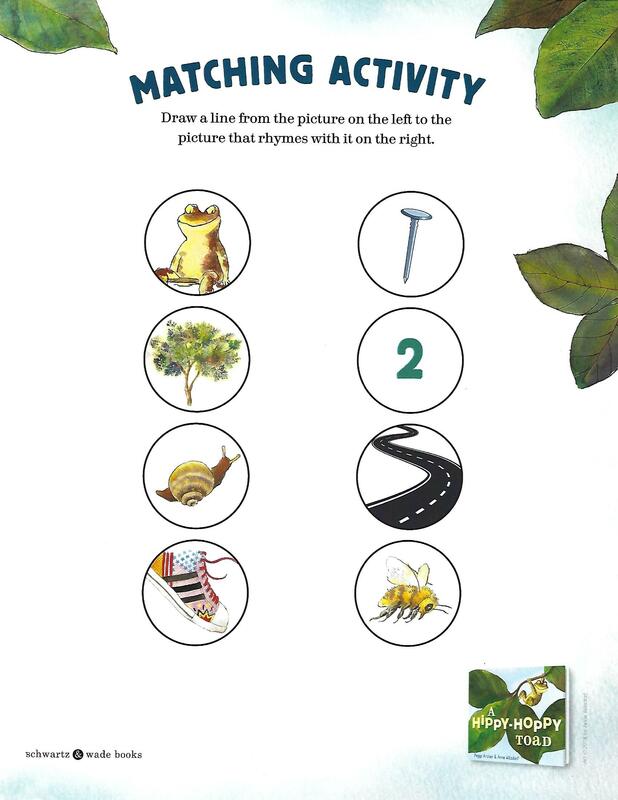 Click here to see the program guide which includes activities, a craft and ways to use A Hippy-Hoppy Toad in storytime. Listen to the author talk about how she got the idea for A HIPPY-HOPPY TOAD and hear her read an excerpt from the book. "A catchy, “hippy-hoppy” storytime read-aloud with “easy, breezy” language." (Picture book. 3-7)"
"...No sooner are readers introduced to the smiling yellow toad than he's catapulted into an adventure: "SNAP! went the twig./UP! went the toad." It's the first of many abrupt transitions in the toad's cumulative, circuitous odyssey down a road and back again. Every shift in the action is marked with onomatopoeia—the toad hops, thumps, swooshes, and lots more besides—adding punch to the rhyming repetition of the text. Lively, textured illustrations, done in bold naturalistic colors, also enhance the action..."
"...The chantable rhythm of the text and the occasional burst of onomatopoeia pair well with the art, and the side-of-the-road landscape and its small creatures provide big comedy, excitement, and personality." A Hippy-Hoppy Toad won the 2015 Society of Children's Book Writers and Illustrators Work-in-Progress Award for picture book text.